Hale O Kaula v. County of Maui. The Becket Fund for Religious Liberty (n.d.). Retrieved from https://www.becketlaw.org/case/hale-o-kaula-v-county-maui/. Hale O Kaula v. County of Maui. (Apr. 04, 2019). https://www.becketlaw.org/case/hale-o-kaula-v-county-maui/. "Hale O Kaula v. County of Maui." The Becket Fund for Religious Liberty. Accessed [Apr. 04, 2019]. https://www.becketlaw.org/case/hale-o-kaula-v-county-maui/. They just wanted to worship and till the earth. A simple beginning to a not so simple story. Hale O Kaula was a small congregation affiliated with the Fellowship of the Living Word that had been worshipping in the small Hawaiian community of Haiku since 1960. 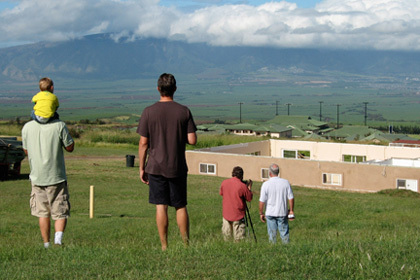 As they began to expand, they bought a new, six acre piece of land in 1991 in the Kula area of Maui. The congregants were thrilled, because the new space was large enough for all of their proposed religious activities, as well as spacious enough to pursue a ministry characteristic of its denomination: agricultural activity drawn from the Old Testament of the Bible. In 1995, they applied for a permit to build a spacious 8,500 square foot facility which would house a sanctuary, fellowship hall, restrooms, kitchen and offices. But the permit was denied. So they built a smaller, solely agricultural building a few years later. The next year, they applied for a permit to add a second story to the building for religious worship. Their request was denied again. Enter the Becket Fund. We filed a lawsuit on behalf of the church in the U.S. District Court in Honolulu, charging the Maui Planning Commission, Maui County, and the State of Hawaii with violating multiple provisions of the Religious Land Use and Institutionalized Persons Act (RLUIPA), as well as depriving the church of rights guaranteed to it under the U.S. and Hawaiian Constitutions. We made sure that the members of the Maui Planning Commission were served with the complaint as they walked in the door for their regular meeting in Wailuku in October, 2001. Enter the U.S. Department of Justice, in defense of the constitutionality of RLUIPA as well as in opposition to Maui’s blatantly discriminatory posture. What ensued was a legal back and forth that included the congregation erecting tents on their own property and holding worship services, to which the media showed up and to which the County’s attorneys told them that “your past Sunday worship would probably not violate” Hawaiian law “if it is not a ‘regularly conducted church service’”—in other words, you can worship here every now and then, but worshipping every Sunday is out. Ultimately, after several court rulings in favor of the church, Maui gave in. Hale O Kaula is now able to hold church services on its own property. Every Sunday.